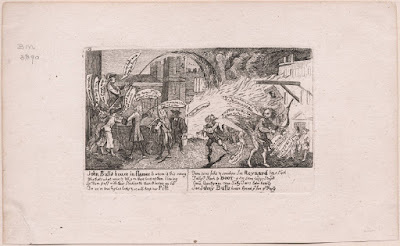 John Bull's House in Flames, Sumpter, 1763, Walpole Library. What we have here is a poorly crafted knock-off of the previous year's John Bull's House Sett in Flames, also in the collection of the Walpole Library. Both show Britain's metaphorical house engulfed in flame in an allusion to the course of the Seven Years War and impending peace. 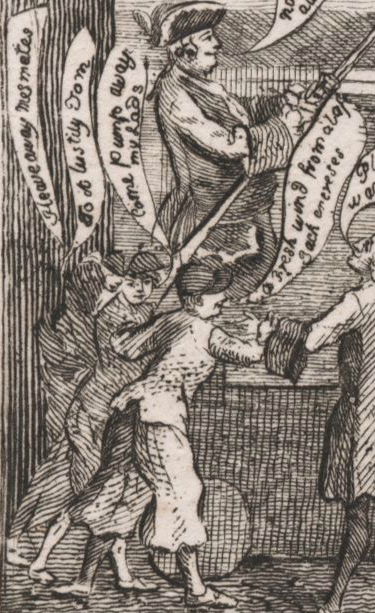 "A fresh wind from aloft Jack encreses"
The sailor in the foreground wears a jacket with a single vent at the back, a jockey style cap, and petticoat trousers. His mates are difficult to make out, but one wears a bob wig and reversed cocked hat.